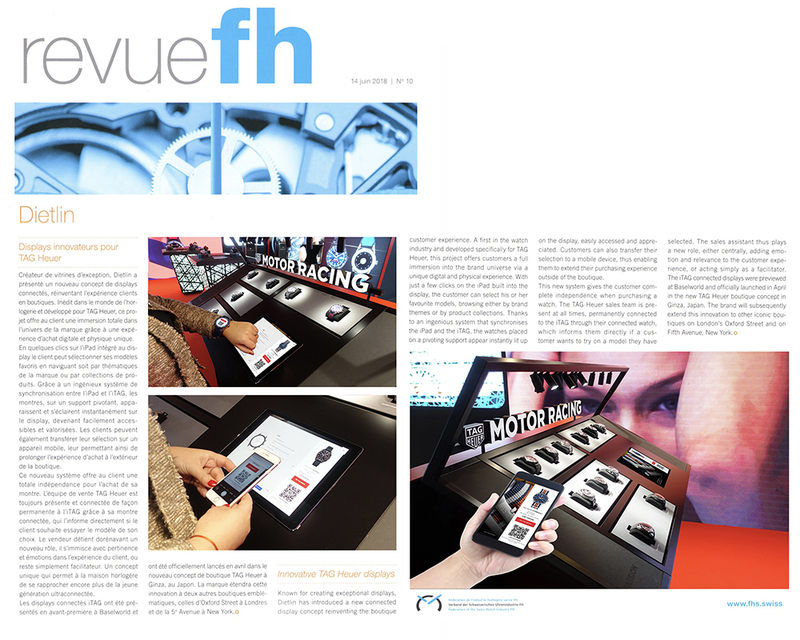 Revue FH (swiss watch federation): Dietlin, innovative TAG Heuer displays. Known for creating exceptional displays, Dietlin has introduced a new connected display concept reinventing the boutique customer experience. 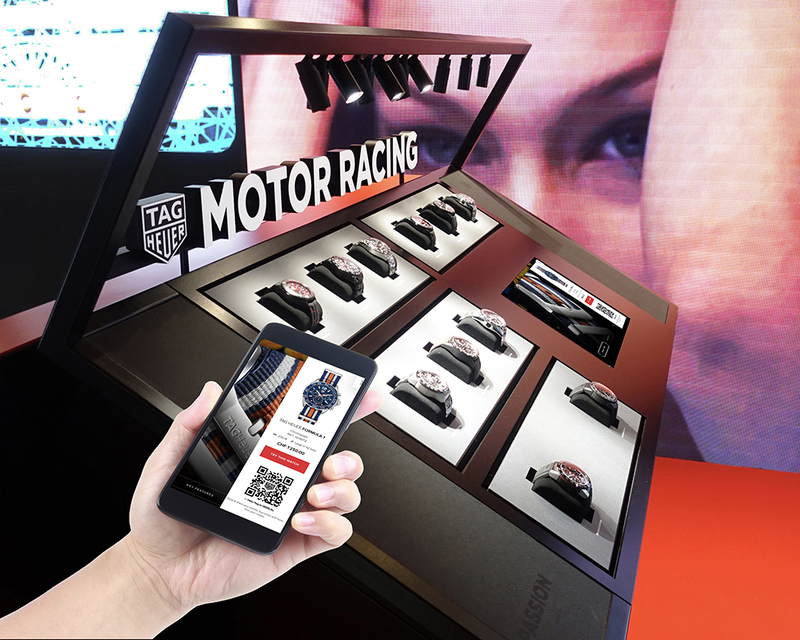 A first in the watch industry and developed specifically for TAG Heuer, this project offers customers a full immersion into the brand universe via a unique digital and physical experience. With just a few clicks on the iPad built into the display, the customer can select his or her favourite models, browsing either by brand themes or by product collections. Thanks to an ingenious system that synchronises the iPad and the iTAG. the watches placed on a pivoting support appear instantly lit up on the display, easily accessed and appreciated. Customers can also transfer their selection to a mobile device, thus enabling them to extend their purchasing experience outside of the boutique. This new system gives the customer complete independence when purchasing a watch. 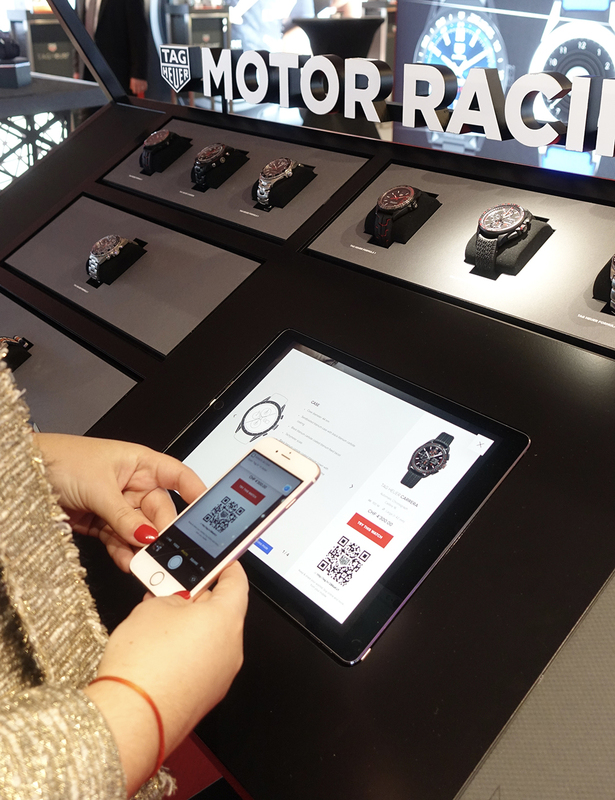 The TAG Heuer sales team is present at all times, permanently connected to the iTAG through their connected watch, which informs them directly if a customer wants to try on a model they have selected. The sales assistant thus plays a new role, either centrally, adding emotion and relevance to the customer experience, or acting simply as a facilitator. The iTAG connected displays were previewed at Baselworld and officially launched in April in the new TAG Heuer boutique concept in Ginza, Japan. The brand will subsequently extend this innovation to other iconic boutiques on London's Oxford Street and on Fifth Avenue, New York.